Grilling your burger and choosing extra lean mince and bacon is the key to making these so much healthier than one you buy from a fast food store! 1 Place the onion, beef and parsley in a large bowl. Season and mix well with your hands until combined. Divide the mixture into eight equal portions and form each into a burger. 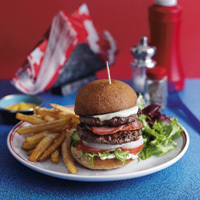 Place the burgers on a plate lined with baking parchment, cover and chill for 30 minutes. 2 When you’re ready to cook, preheat the grill to high. Heat a large non-stick frying pan over a high heat then gently press the burgers into the pan – you may need to cook them in two batches. Cook for 1 minute then turn and cook for a further minute to seal. Reduce the heat to medium and cook for a further 5 minutes, turning frequently until cooked through. 3 Meanwhile, grill the bacon for 3-4 minutes on each side or until cooked to your liking. 4 Remove the burgers and the bacon from the heat and drain on kitchen paper. 5 Mix the mayonnaise and fromage frais together and spread on both halves of the rolls. Fill with the lettuce, cucumber, tomato, onion, burgers and bacon. 6 Serve hot with chips (Slimming World style) and plenty of salad.